2.4 GHz wireless You get fast data transmission and virtually no delays, dropouts or interference. Plug-and-Forget Nano-receiver The cordless, USB Nano-receiver is so small and unobtrusive, you can plug it into a USB port and forget about it. Broad game support From old standbys to today’s biggest titles, the Logitech Wireless Gamepad F710 is easy to set up and use with your favorite games. Profiler software For games without native gamepad support, you can customize your experience with fully programmable controls that can emulate keyboard and mouse inputs. Dual vibration feedback motors You can feel every hit, crash and explosion in games that support vibration feedback. Refer to game documentation for information about vibration support. Familiar button layout You control the action. A familiar shape and button layout gets you in the game faster without having to relearn new gamepad settings. Cons: -since release of windows 10, my computer won't recognize it. it used to be a challenge to get my computer and then games to recognize it as 360 controller, but now it seems impossible. logitech support will give you bogus solutions, but the truth is they never bothered to make drivers after windows 7. Pros: - work with every game I try and PS1, PS2 emulator. Other Thoughts: - if you had difficult time to run an old ps3 controller or any consul controller on PC, this is the perfect replacement. 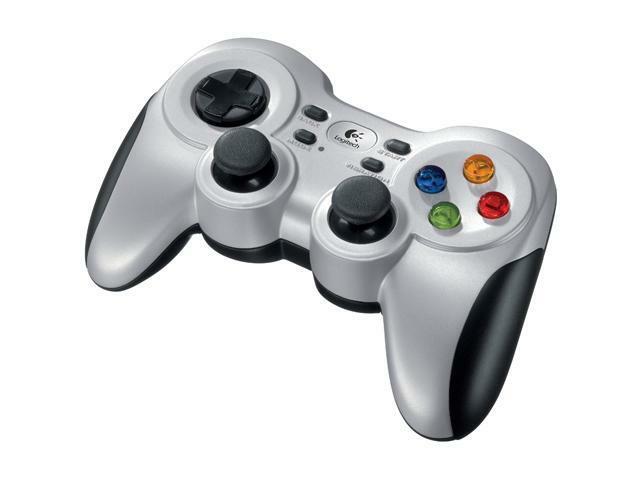 - I really like this controller it worked without a problem, which is hard thing to achieve in a PC. Cons: Not precisely a 'con' so much as a dislike that I'll get used to - the L2 and R2 buttons are different from the Rumblepad 2, with a much longer range of motion (not a button push like the L1 and R1 buttons). Not a big deal, it just makes the gamepad feel slightly smaller or different somehow in my hands than the Rumblepad 2, in spite of having the exact same dimensions. I'm sure I'll get over it. (Edited and added at 2 months ownership): Range is good, but like Stephanie B has noted in her review, the gamepad randomly drops connection for a second or so occasionally. Whatever the problem is, it isn't an issue of 'range'. It only happens very infrequently for me, maybe 15 times in 2 months (used daily for at least a half an hour a day). I'm not a 'professional' gamer, and the momentary spaz isn't enough to get me killed in the games I play (or I'm good enough to recover from it), so it doesn't bother me as much as it probably will others. But the problem does exist, and some people will find it to be an unacceptable annoyance and distraction from their gameplay. Other Thoughts: One button finally died on my Rumblepad 2, after 6 years or more of use. I sure hate to throw it away, but since I cannot find replacement rubber pads (internal) to fix it (the only thing that's wrong), getting this as a complete replacement was certainly my next best option. I'm using my gamepad on both a Windows machine (XP) as well as a Linux machine (Ubuntu). It's mostly used as a Dolphin emulator gamepad (both machines) as well as for GTA games on the Windows machines. For any Linux users, just letting you know that the F710 works with Linux, too. Pros: The controller is very comfortable to hold and has a good weight. Cons: The wireless drops out for a second or two sporadically. In the time it takes to reconnect, whatever buttons you were pressing, will not work or will continue to be held down. So, if you were pressing up-left on the D-pad, your character will keep moving up-left. This is very frustrating. Reading other reviews, I found that I was not the only one who has the same problem. I was at 10-20 cm from the receiver when I experience the problem, so I was not out of range. I do not recommend buying this controller. Other Thoughts: I have returned the controller and got a Xbox One Wireless controller instead (CWT-00001). It's a much better controller. Cons: Feels terrible in your hands. Barely works even when just a few feet away from the receiver. Randomly stops taking button input. Other Thoughts: I would not recommend this controller. I wish I got my money back when I had the chance. Pros: The form factor of this gamepage is, IMHO, the best. No matter what game I play it is comfortable and I can find a good button arrangement. Cons: It's a little heavy, which can be slightly uncomfortable when playing for a long time. There is a button that seems to do nothing but make the pad rumble, which is rather useless. Other Thoughts: I have used this on my Ubuntu machine and on a Raspberry Pi using RetroPie. It works with absolutely no hassle, and if many of the reviews on here are an indication, maybe even better than on Windows. Pros: Using on Windows 10 media PC in decent size living room with no issues. Wired response and feel playing Mass Effect 3 N7, Tomb Raider, Need for Speed (2015), and Star Wars Battlefront. I bought this one to replace an aging Logitech F510 wired controller that I loved and have not been disappointed. Cons: Requires AA batteries. Wish they would go the way of USB rechargeable like most devices. Other Thoughts: I bought this one to replace an aging/damaged Logitech F510 wired controller that I loved and I love this one too. I don't get the negative reviews. I sit in a recliner a good 12 feet from a 55inch led.